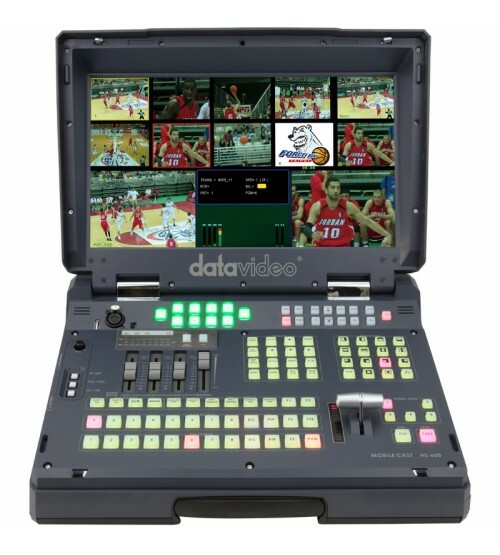 Datavideo HS-600 is a lightweight Standard Definition studio in a box. The HS-600 is in many respects an affordable, standard definition version of a full broadcast model. It will work time and again in the pressured conditions of live video production. Combining a vision mixer with a built-in multi-view 17-inch LCD screen, the HS-600 is designed to be live in seconds. However, it goes well beyond simple switching with a number of highly sophisticated functions that give users the scope to use it in demanding conditions. Despite its small size, it can take feeds from up-to 6 cameras as well as mixing the input from graphics stations, powerpoint presentations and four external microphones. Ergonomic controls allow the user to switch seamlessly between video and audio sources and blend high-quality digital content on the fly, even without external genlock, thanks to the built in time base corrector. Furthermore, its intercom and tally system allow for communication between presenters, the director and the production crew, ensuring that shoots run professionally every time. The complete system includes a single, secure power supply from one connection. Where the production is taking place away from the studio and mains power is unavailable, the HS-600 can even be powered from a 12v DC car battery. It is a go-anywhere product, ideal for corporate, AV and the worship markets. It is also an excellent broadcast training tool. Hot key functions allow quick access to vital functions including fade to solid colour, instant key and more.